I received a last minute invite to fill the vacant 13.5 slot at the CARS Summer Shootout. This gave me the opportunity to try the car at a big event with the kit front end, before replacing it. The limiting factor I knew would be tyre diameter, as with the higher grip levels seen at big events, ideally I would need to fit smaller diameter tyres to avoid grip roll. This proved to be the case with me grip rolling through the first 2 qualifying rounds if I made the slightest error. I was running CRC Greylo rears and Magenta fronts straight from the box, which gave me 45.5/47.5mm dia tyres. The car showed promise though as I still stuck in the fastest lap for the class by 0.4 seconds, despite driving well inside myself to stay on 4 wheels. 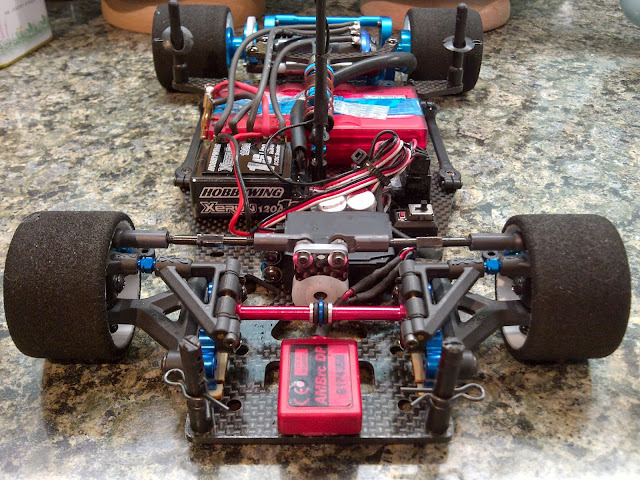 For Round 3 I trued the tyres down to the minimum for the front end of 43mm, to give me 3.5mm ride height. The rears I trued to 45mm to keep a 2mm stagger front to rear to aid the balance of the car. This is where I normally start with my tyres at club racing, so they were still a little big for this event. And grip roll again, but now up to 4th in class, 5 seconds off pole. Out came the superglue for round four. I ran a bead of this round the outer sidewall of the front tyres and wiped off the excess. This gives a firmer sidewall, reducing tyre flex and grip roll. And it worked! For 2 minutes I was neck and neck with the current polesitter, then a stray car flew over mine removing the roll over mast. This wouldn’t have been a problem as it barely upset the car, except the mast had snagged the sensor cable and unplugged it. Suddenly I had reduced top speed, and very little throttle control. I chugged it round keeping to the neatest lines possible and in the process shaved 2 seconds of my fastest run. However, it was only good enough for 4th, 3 seconds off pole. My final came to a premature end after being shunted from behind by someone else’s accident, knocked clear of the track, and promptly forgotten by the marshal. When he did remember I was the best part of a lap down, so after being collected by a number of other peoples accidents (mostly cars launching off barriers and mine then being in the line of fire) I parked it. I’d done enough to prove the car was quick as (almost) standard, but would struggle at big events due to the limitation on front tyre diameter. 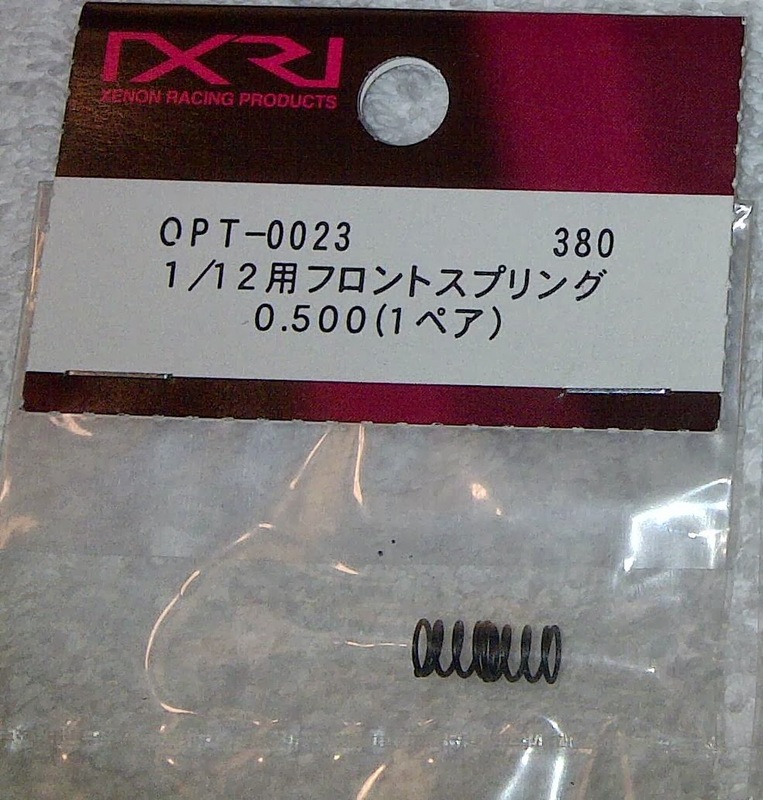 I also had a new weapon in my Arsenal thanks to the Zen Racing team, who supplied me with the Xenon front end as an alternative for the AE 12R5 front, and for a similar price. The VSS Xenon 1/12 front-end is a high quality alternative for the standard Associated 12R5 front end. Last season, multiple world champion, David Spashett, used it successfully to take both the Stock and Modified BRCA National titles. It is available in regular or hard material; the regular is for normal temperatures; the hard for high temperatures and possibly for the increased grip levels we may see at the UK Nationals with the newer additive types available this season. It is available in the UK through Zen Racing, who David has now joined after leaving Horizon Hobby. 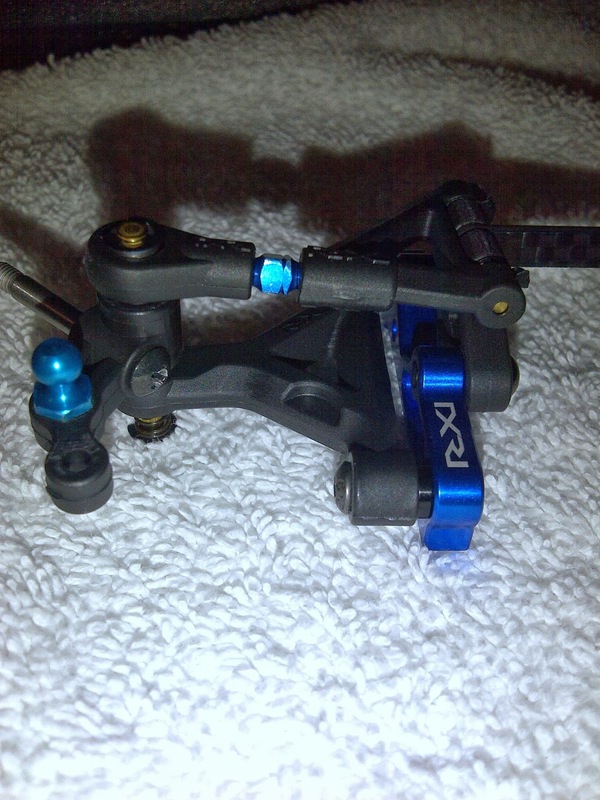 Xenon is the first company to allow you to choose the kingpin angle for the front knuckle from 6 steps (0-5 degrees). Other features are its easily adjustable width using screws from the outside of the lower arm as well as a two part upper arm with turnbuckle adjustment. 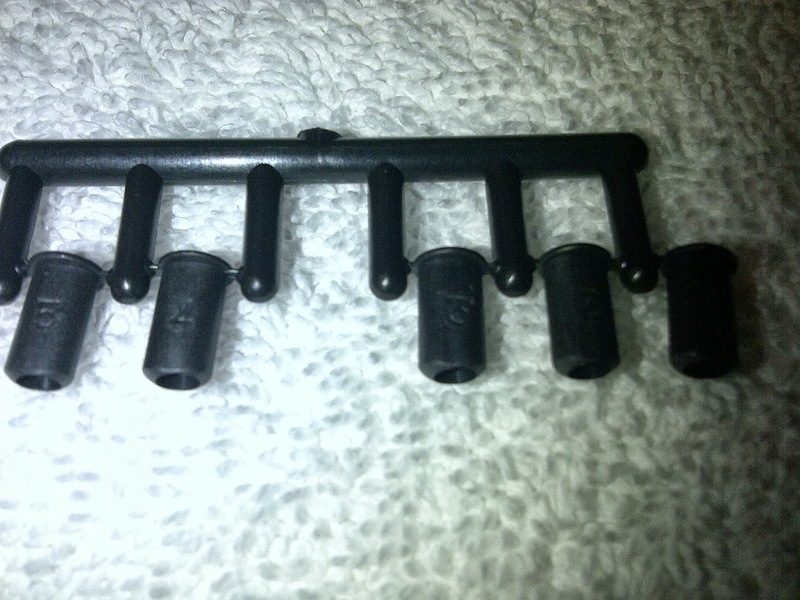 The bulkheads have been made from 7075 aluminium while the king pin and hinge pin have been made from coated titanium. This optional front end package fits any chassis using the AE R5 style front end. Xenon also produce optional bulkheads that allow fitting to chassis using the older AE L4 hole spacing using 8/32 screws. The kit comes very nicely packaged in its own carrying case, which after assembly provides storage for the optional steering arms, and any ancillary parts such as spacers and springs. 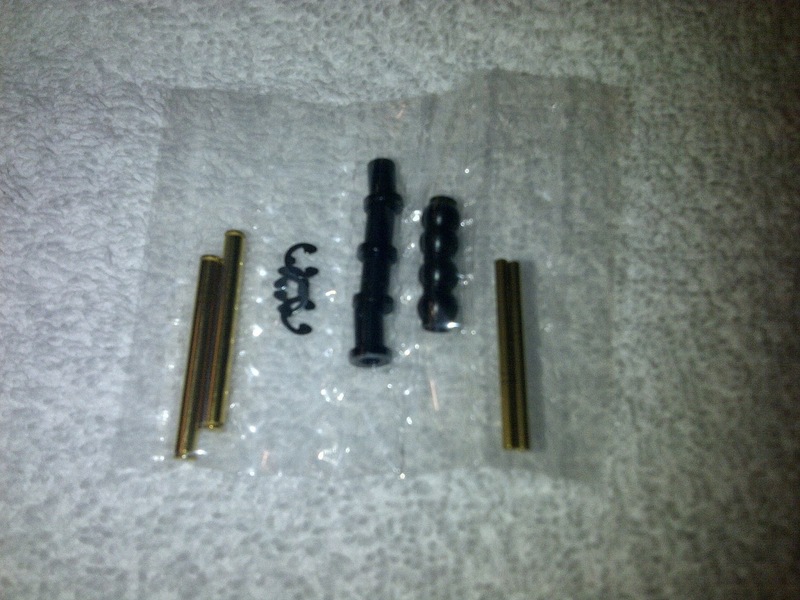 The kit does not come with any screws, shims, springs, turnbuckles or axles. Not an issue if upgrading an R5, but something to remember if purchasing for another car. 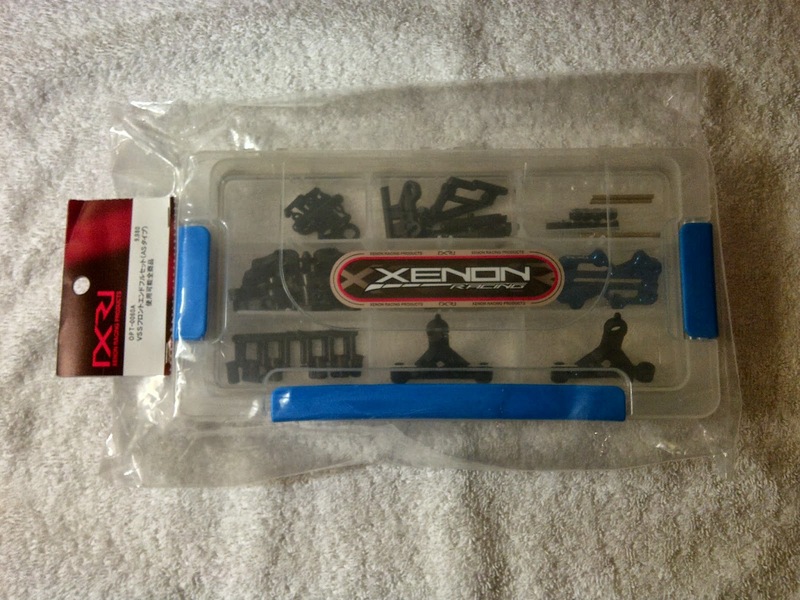 The parts are readily available from Associated or even Yokomo, and Xenon also produce high quality springs which are also available through Zen Racing. More on these later. Even so, the kit is competitively priced when compared to the standard AE front-end, even after purchasing the outstanding items. All components are available individually, so a gradual upgrade is also an option as the R5 components wear out. One final thing to note; if you have not built an R5 front end before, you will require an R5 manual for reference, as build instructions are not included. These are readily available to download from the Associated website. Any version of the R5 will do, as the differences between the R5.1 and R5.2 are different again on the Xenon and are outlined here. The moulding and quality of the plastics is of the highest quality I have come across in a 1/12th car. There is minimal flash to remove and the plastic looks and feels durable, with the right amount of stiffness whilst not being so brittle as to prematurely end your race when the car takes a peek at the barrier. The alloy components are at least equal to the best 1/12th cars out there regarding machining quality and finish. The 7075 alloy also feels and sounds quality. If you tap it (or drop it, ahem), it has a clear ring to it and not a dull thud. Having spent 12 years working with 7075 alloy on aircraft I can testify to its durability and stiffness. So, on to the build. First up is assembly of the steering blocks. You have 6, yes 6 options! The zero degree blocks are equivalent to the standard R5 blocks. These are what I chose to begin with as a starting point. The other 5 pairs of blocks are all identical mouldings, which take a top hat insert to give the different kingpin (1-5 degree) angles. The top hats all have the angle moulded clearly onto the body. The inserts push into the steering block from the top. How these will affect the handling of the car is yet to be seen. The zero degree blocks are assembled the same as the standard AE components. I did notice that the back of the axle protruded fractionally from the rear of the block, allowing the tiniest bit of movement in the axle. If this wasn’t addressed, it would gradually get worse with use, but the solution is simple enough. I placed a 1/8” dia 10 thou thick shim under the screw head and hey presto! 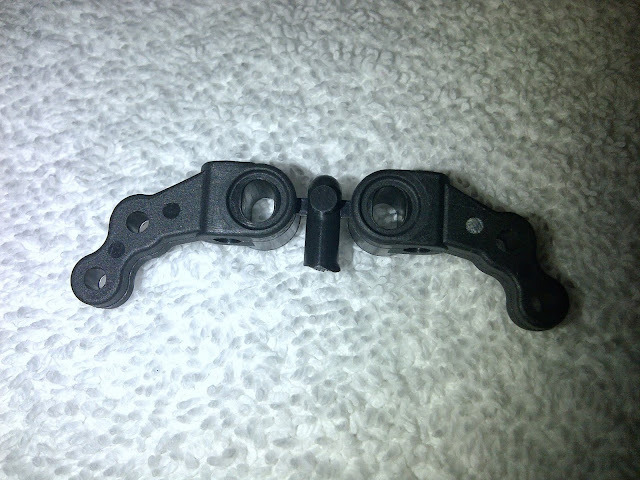 The offset steering blocks are from a different moulding, so may not require the shim. Or the quality control of the axles may have allowed a slightly longer pair to slip through the net. Other people I know have reported quality lapses in the R5 front end. There is a choice of 2 holes for the steering balljoint. These will allow options with tuning the Ackermann to give precise handling. Ackermann relates to the angle of the front wheels under cornering. The inside wheel is following a smaller radius curve so should turn more than the outer wheel. However, due to the nature of 1/12th pan cars, this is sometimes ‘bodged’ to alter the handling with variation up to both wheels turning the same amount being used. 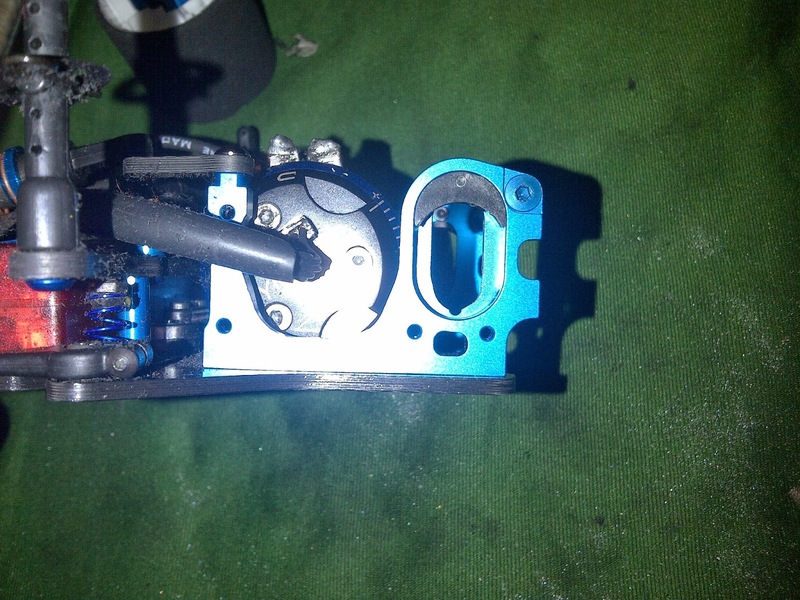 Moving the servo fore/aft in the car to alter the angle of the steering links also affects the Ackermann. The inner hole mimics the R5 block. 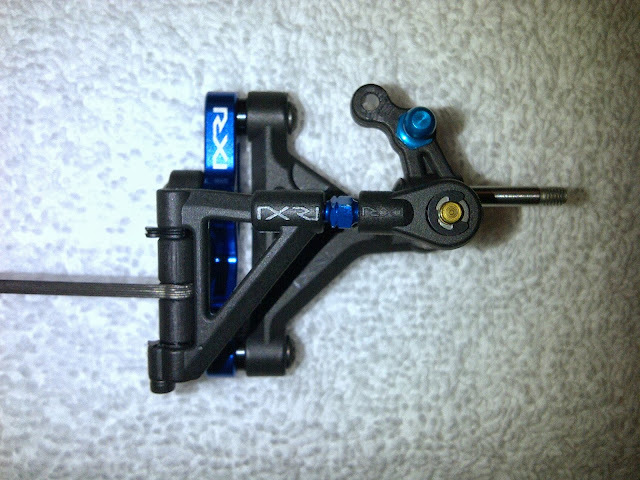 Assembly of the upper arm follows. There Xenon eyelet does not appear to have a specific orientation, unlike the R5 component, thereby simplifying the build. The pivot ball pushes in easily, but once in is held securely with no play, and moves freely! Very precise. There is a special tool available for inserting and removing the pivot balls. I fitted mine quite easily though by placing the ball over the arm and pushing firmly with my thumb over the pivot ball hole. The lower arms are assembled next. The correct orientation is with the half-moon recess in the arm to the rear. 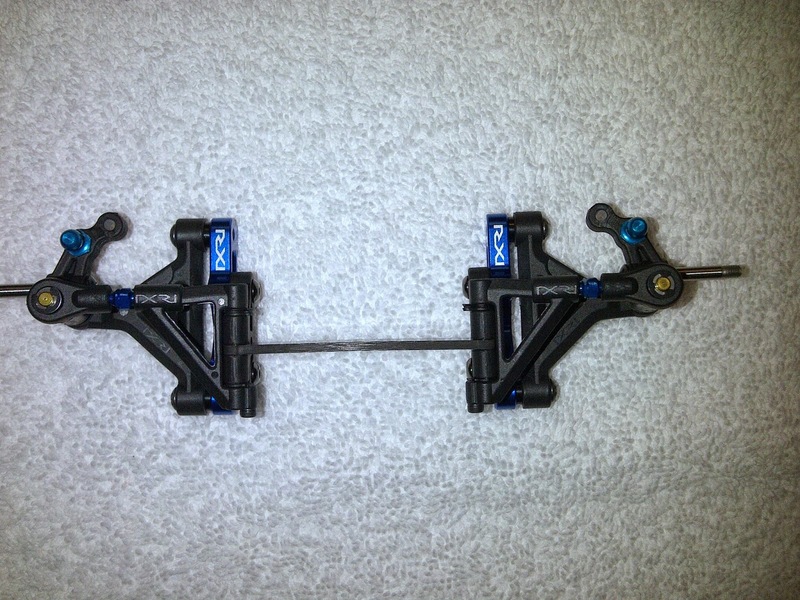 This allows the steering arm a clear sweep without impacting on the arm itself. Another clever little touch. The pivot balls again have no play and move smoothly. The small tag on the end of the arm is to be removed so as not to foul the wheel. The best way to remove this, and remove the plastic components from the sprue appears to be to score round the joint with a sharp blade and then flex the waste part to snap it off cleanly. The remaining area can then be sanded smooth. Attaching the arm to the bulkhead is different from either of the R5 solutions. The bulkhead is threaded for the screw as per the R5.2, but the arms take top hats as per the R5.1. These top hats are not threaded though, and fit as shown in the photo, with the ‘brim’ of the hat between the arm and the bulkhead. The upper arm mount fits as per the standard AE instructions. Kingpin time. No play whatsoever, and the smoothest action I have ever seen in a 1/12th front end. My previous builds have had polished kingpins and lube and not achieved this standard! I am undecided whether to even lube the kingpin, as it will only attract dust and dirt and promote wear. This quality of component fit alone justifies purchasing this front end in my eyes. 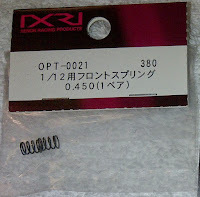 I decided to treat myself to the Xenon front springs, as my AE springs are fairly worn out. 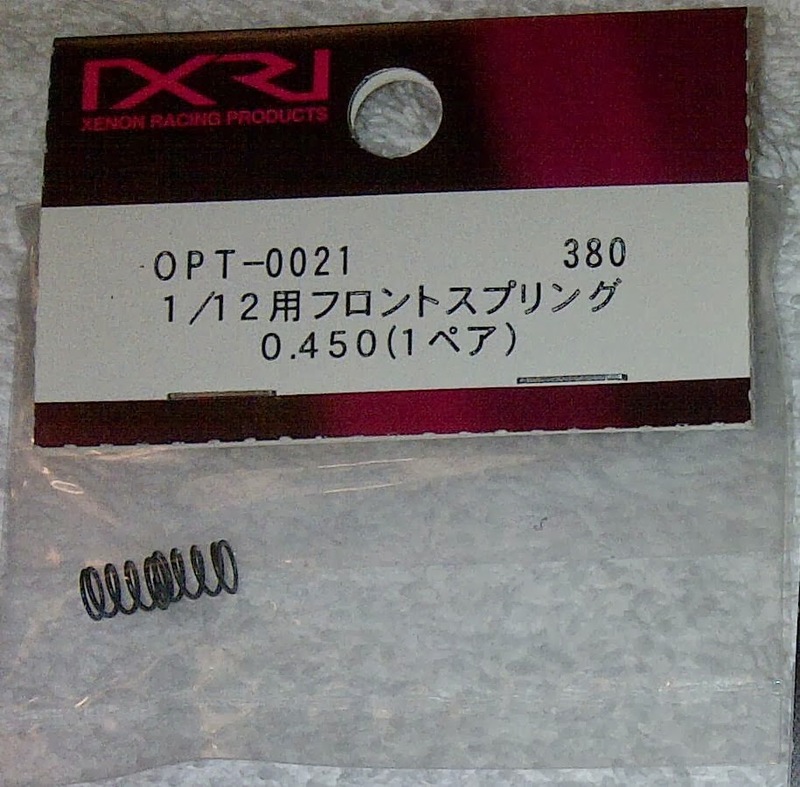 They are made from different wire gauge to the AE springs, and come in metric sizes. They appear very similar to the CRC springs I have used for a number of years with no issues. But whereas the CRC spring are shorter that the AE equivalent, these appear the same length. At least when compared to my well used Associated springs. I chose to fit the 0.45mm springs which I believe equates to an AE 0.018”. 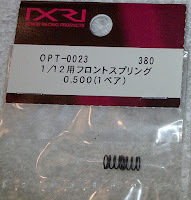 I also purchased the 0.50mm which is roughly an AE 0.020”. If they live up to the CRC standards, and I have no reason to believe they will not, they should hold up well with none of the collapsing I have experiences on the AE springs. Lastly, we insert the hingepin. 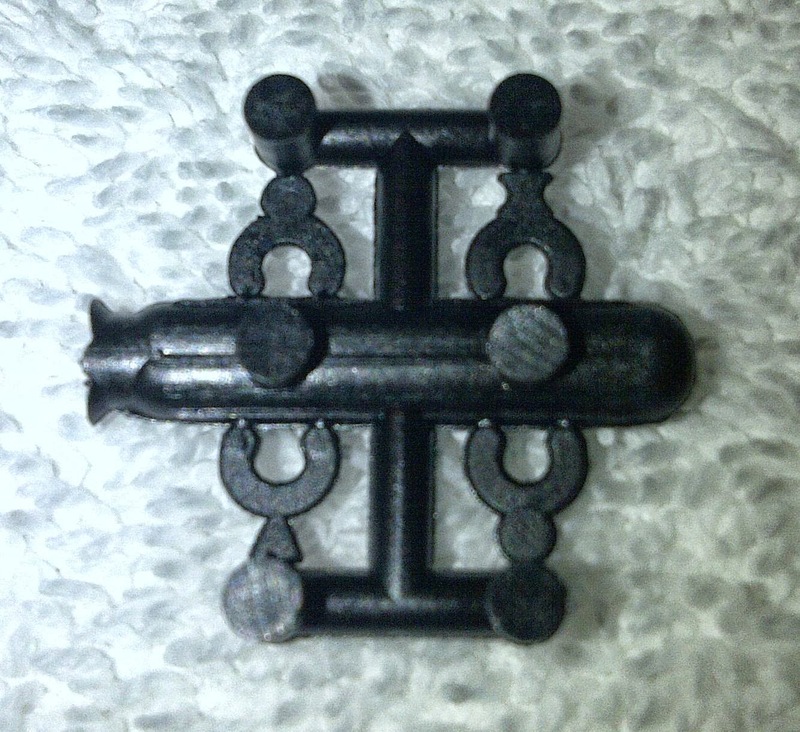 There is no cross brace included in the kit either, but I believe the same is true of the AE front-end kit. 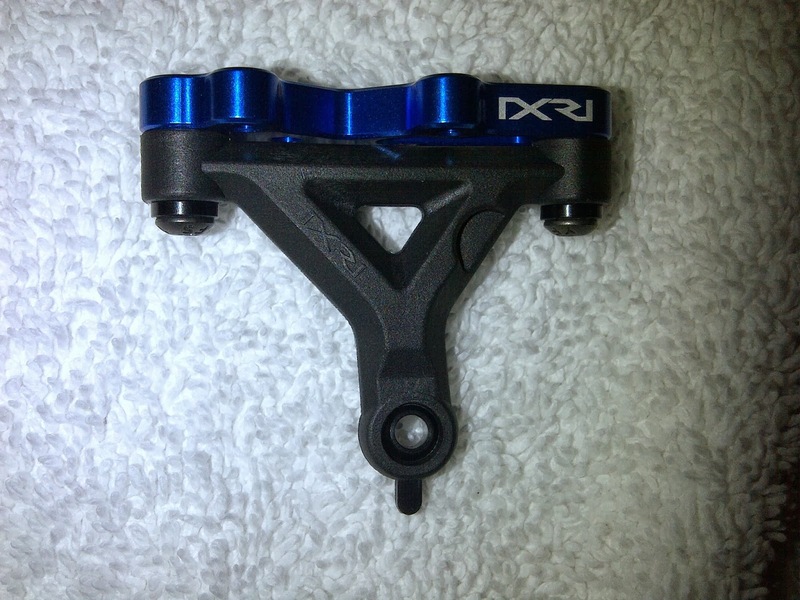 A cross brace is essential in carpet racing to stiffen up the front end which experiences high cornering forces. It is not as essential on asphalt tracks, as the loads are lower, and allowing more flex will promote more front end grip. The shims for the upper arm mimic the R5, but come in 4 sizes - 0.3/0.4/0.5/0.6mm. You will need to dig out the vernier to measure them. Whilst doing so, take note of the different tail shapes, as this will identify them later. The shims allow you to alter the static castor of the kingpin. Basically, the more it leans back, the less steering, or bite, you have. You can tune the angle from 2 to 6 degrees, and the angled steering blocks will also give further tuning options, as previously mentioned. Do not confuse static castor with dynamic castor. Dynamic castor is the amount the kingpin castor angle changes throughout its travel. This is altered by changing the angle of the upper arm. The upper arm can be set at 0, 5 and 10 degree angles. Zero degrees means there will be no castor change throughout the travel, giving a neutral effect much like the standard front end, but with the camber changing due to the upper arm sweeping through an arc. The other options reduce the castor angle throughout the travel. The 5 degree setting is most commonly used, as it gives reasonably mild turn in but holds the line mid corner and on exit. The 10 degree setting usually gives aggressive turn in to a corner, which washes out on corner exit. And there you have it. Complete and ready to install on the car. The hole spacings on the RM01X are not quite identical to the 12R5. The bulkheads bolt straight on, but the spacing across the chassis is fractionally narrower than on the 12R5. So, off with the brace. I did however still want to fit a brace to stiffen up the front end for carpet racing so out came the old CRC cross brace. Once bolted to the car, I found I had more than enough ride height adjustment, allowing me to run the front wheels right down to the rim. The rear end was still slightly limited, as the 2.5mm offset axle spacer still only allowed a rear tyre of 43mm. If I tried to fit the 3mm, never mind the 3.5mm spacer, the axle would rub on the bulkhead. A quick blast with a round file, and I found enough clearance. So the car can now run skinny tyres which are ideal for high grip track conditions. The new front end was a revelation.The action is so smooth due to the coated hingepins. I even invested in a second pair of hinge pins for the Speedmerchant. With the standard blocks, the car gave precise steering and made placing the car on the track so easy. I played with different settings, but ended up reverting to the standard settings from the Associated instruction manual, with the 0.50mm springs. David Spashett then provided some information regarding the alternative steering blocks. The inserts give different camber settings to the block. He suggested running the 2 degree insert to add 2 degrees positive camber, then shortening the top link to return the wheel to its 1.5 degree camber setting. This leans the kingpin into the car giving very different geometry as you apply steering. The idea is to calm the car down entering a corner, but to give good steering as you apply the lock. It will allow you to have good corner speed and control of the car. And it did! The car wasn't so aggressive on corner entry making it easier to drive. Once I got round the few headaches I gave myself by not checking the tightness of the side link screws, that is. Doh! I will be leaving the car set like this for the first UK National at Teesside next weekend with the car now safely packed away. Oh, and there was one final change, courtesy of Mr Spashett's input again. He demonstrated how inconsistent tube dampers are by working the damper by hand for 30 seconds when it was off the car. It then gave zero damping effect. After waiting a handful of seconds, the grease thickened back up and returned to normal. David runs an oil damper on his car to maintain consistency. Tamiya provide one as an option, which would be worth considering. But my bottomless pit box contained a 12R5 damper which will bolt straight on. So I did! You may notice the Associated blue side springs too. 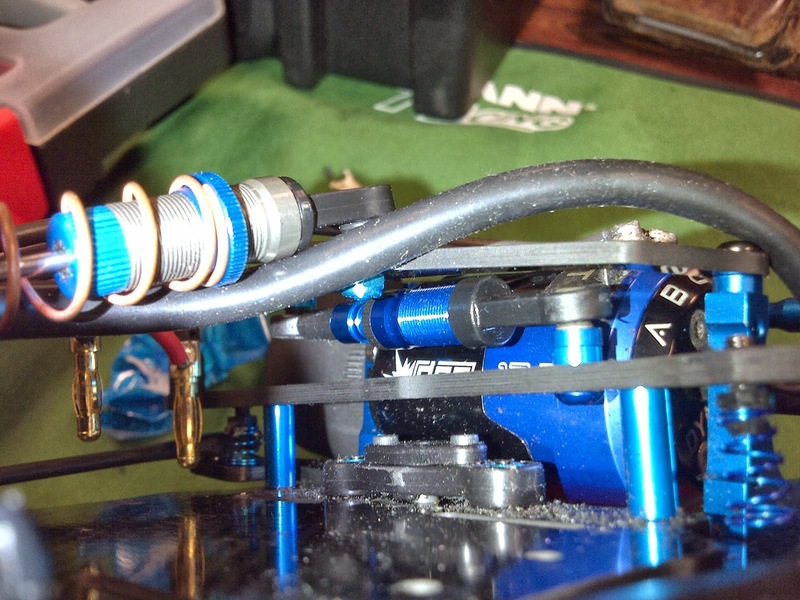 I had to use Associated cups to fit them on as the Tamiya cup is a slightly smaller diameter, leaving the spring loose. This change has softened the back end slightly, and calmed the rear just a touch. Good luck at Teeside :) the car is looking phenomenal!